In my first Creating an eBook post, I talked a bit about the initial phase of deciding to write an eBook and figuring out where to go from there. In this post, I want to delve into the process of creating an outline. In the initial brainstorming phases, I pretty much captured anything and everything on paper. If an idea popped into my head, I wrote about it in a list or journal entry. The idea for my book was, at first, very broad. First, I wrote out main themes and jotted notes under each one. Just some general ideas I wanted to explore/cover in my book. Next, I wrote out actual ideas for chapters, and using the main themes I had already identified, I determined in which chapter I would cover each theme. The third thing I did in my outline-making process was to write the main take-aways I hoped readers would be blessed with by reading my book. I think of these take-aways as the true heart of the book. By putting the outline process into three main steps, I make it sound very short, but I do want to say that I spent MONTHS doing that (and continue to refine my notes — even though I’m in the writing phase at this point. More on why I am following the outline, but also leaving things a bit open in an upcoming Creating An eBook post. 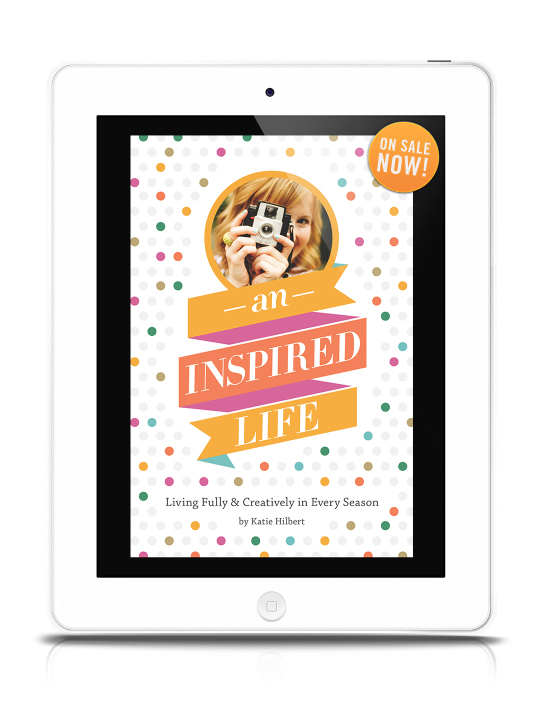 So excited to share more about An Inspired Life in upcoming posts! For a while now, I’ve wanted to share with you a little behind-the-scenes look at my eBook process, so today, I thought I’d take you through some of the initial brainstorming phases. As with most creative projects, my eBook started with an idea — an idea and a wonderfully inspiring conversation with a dear friend. Remember when I attended Weapons of Mass creation? Well, there I was that hot summer day (very hot, actually), wandering around with one of my dearest friends, talking creativity and discussing the crazy process of making things and taking risks and following dreams. Somehow, we must have landed on the topic of books and writing, because all of a sudden, there she was planting the idea in my head to write an eBook and publish it myself. Strangely enough, it was an idea I’d never considered, but the more I thought about it, the more inspired and encouraged I felt to go for it. At that point, however, I wasn’t sure what it was that I’d write about. It probably took another month or so for the idea to fully form, and I will say that during that brainstorming time I found this often-quoted piece of advice to be true: Write/create what you want to see/read. Let me expand on that idea a little further by sharing two quotes from Annie Downs (who recently taught a class about writing in all seasons for The Influence Network). While I wasn’t able to attend the class, I did snag these gems from Twitter, and they really speak so perfectly to this idea. I found those statements to be very true in my brainstorming phase of eBook creation (even though I didn’t know about them at the time). As I was dreaming and planning, I was thinking a lot about who I was as a creative/woman of God and what inspired/encouraged me. I was thinking about the life season I was living and everything I was learning through God’s generous love and grace. It also helped that at around the same time I decided I wanted to write an eBook, I was also redefining the focus for my blog. That whole blog reorganization/rebranding essentially led me to decide I wanted to write about how to live inspired, creative, fulfilling lives in every season. My next piece of advice for the initial phase of brainstorming and creation is this: don’t rush the process. Even after you’ve dreamed up an idea, take your time to really sit with it. Journal about it. Make lists. Pray about it. I have pages and pages in my journal with lists and ideas for my eBook — and not everything will make it into the final book. You have to give yourself the time and space to really get to know your idea. Figure out what it truly means to you and how you might develop it. I honestly spent about five months in this initial brainstorming/praying/journaling phase, and I’m so thankful for the time I spent doing that. It might seem like a long time, but I feel like I know my ideal well, and I know where I want to go with it. Plus, when you generate a lot of ideas brainstorming, it makes it so much easier to actually begin the sometimes daunting task of actually sitting down and creating.